What is it like to ski the last week of the season in the French alps? Above 2000m you have plenty of snow. It is groomed thoroughly every evening and in the morning is hard and covered in ice-balls. This softens up into sliding icing for the middle of the day. You go higher. In La Plagne you get to 3050m where there have been a few centimetres of fresh snow. Over in Les Arcs on the Auguille Rouge you get up to 3250m. Total block is required in the sun. Your face risks burning like bacon left on the hob. Fig.4. 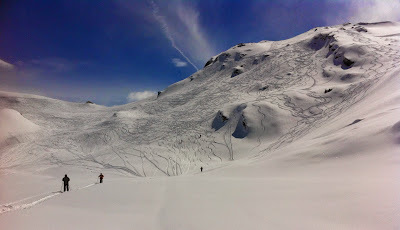 Skiing in late April 2013: Too much snow? So much gaps had to be cut through drifts and avalanches. 3m! Fancy skiing this year? It’s not too late! Fig.1 The view from our balcony – using a 300m lens! Fig.2. Off-piste below Roche de Mio (on the cliff edge). Looking south east towards Val d’Isere’s Grande Casse. This kind of skiing finds me in shorts and a T-shirt. Smothered in sunblock. No gloves if I am carefully not to fall over. No point skiing first thing unless you go high. So I’d go onto the glacier for powder at 3000m until later in the morning. Then head further down the slope as it softens. Lunch at Roche de Mio at 2700m then stay within 800m drop from this point, or return to the glacier. Mid afternoon I pull out a mono-board I bought in 1989! It is over 2m long and feels like you are bolting you feet to a surf board. It rides over slush as if it were fresh powder. It takes some getting used to. Fig.4. Book our flat through Pierre et Vacances. At 2000m you ski to and from your door. Our wonderful studio flat in Emeraude, Belle-Plagne is available to book through Pierre et Vacances from Saturday 19th for the last skiing of the season. Fig.5. Mid-afternmoon from our balcony. La Grande Rochette is that mountain on the left. Looking south east towards Courchevel. Fig. 6. 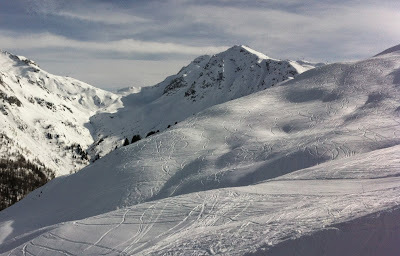 Belle-Plagne from the slopes … a hundred yards down from our flat on the way to Bellecote. The other great thing about being out this week? Empty slopes, except for seasoniers on a last fling and a lot of end of season parties to go to. Our balcony at 2000m faces South West and gets the afternoon and setting sun. Heavenly. 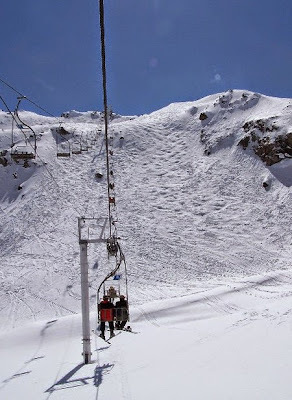 This drop below the chairs has been one of my favourite places to ski since my teens … in the later 1970s! Once though, in a T-shirt one spring this chair-lift broke down for over an hour leaving me sitting in the shade and feeling like a fool. Whatever the weather I now always take jumper, jacket, gloves in a backpack just in case. Fig. 8.Known as ‘Brown Pants Ridge’ off the side of Roche de Mio at 2750m. 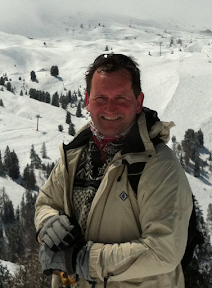 With a Ski Club of Great Britain guide late March 2014. A precarious push and slide along a knife edge ridge with an awkward, though not fatal drop, on either side, into a huge sweeping bowl of skiing. Fig. 9. 385 Emeraude, Belle-Plagne, France. Fig. 10. 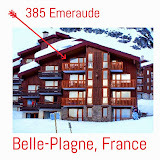 385 Emeraude, Belle-Plagne, France. The ‘studio’ divides into to two distinct sleeping/living areas. The couchettes are over 6ft long, so they take me. I’ve regularly slept four here. Fig. 11. 385 Emeraude, Belle-Plagne, France. The kitchenettes also has views right down the slope and across to La Grande Rochette. Even if you’re cooking you can enjoy the evening sun and fun. Fig. 12. The Kitchenette … 385 Emeraude, Belle-Plagne, France. The cupboards are stuffed with every possible kitchen appliance to accommodate eating for 8 or me. So have friends around, or have an entire service in the dishwasher.